Here it is; the dress to end all dresses! Description: Description: Dress in two lengths with bodice variations. Separate patterns included for B-, C-, and D-cup sizes. 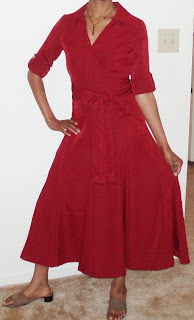 I made View A with the long skirt and 3/4 length sleeves that can be rolled up and secured with a button. I really like this dress. I debuted it this past Tuesday and wore it to my mother’s birthday dinner. My dad, boyfriend, and boyfriend’s mother were all in attendance and raved about the dress. I also toted my new purse. The thing I like most about this dress is that it is simple and classic. Even though the wrap style is all the rage right now, I don’t think this dress is so trendy that it will look out of place in five years. Afterall, look at the camisole top. Those things have been going strong for a while, and I’m looking forward to wearing mine this summer. See complete pattern review here. This is late, but thanks, Adrienne! Do you have a blog, and what is it’s name? Adrienne " A little dramatic at times"
I have this dress but have yet to make it. Your’s looks wonderful!